Parque Nacional Pali Aike is located in the Commune of San Gregorio, 200 Km. NE of Punta Arenas, following the CH 255 Route that leads to Monte Aymond border crossing. Created in 1970, the Park is run by CONAF, Chile's National Forest Corporation. So far little known and promoted, Pali Aike is a good option when visiting southern Patagonia since its tourist attractions are outstanding. The Park comprises an area of Volcanic Fields that during the Pleistocene and early Holocene had great activity, the bizarre landscape is characterized by sparse vegetation, volcanic cones and valleys surrounded by ancient lava formations that dominate the place. 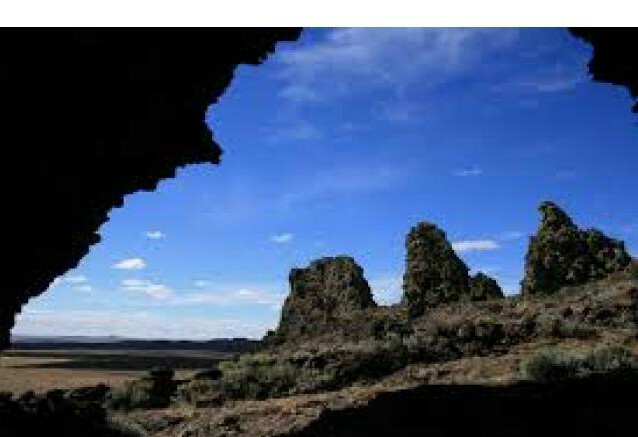 For this reason, the native Tehuelches, or Aonikenk as they called themselves, called the area "Desolate Place of the Evil Spirits", because of the fear they felt for the strange surroundings. Apart from being normally visited by scientists, it is also a very suitable place for those interested in archeology, volcanology, and for the ones who like trekking and outdoor life in general. Fauna: the Guanaco, as throughout Patagonia, is the largest group of mammals within the Park and although far from being in danger of extinction, there are regulations that protect their survival. Other species of the Park are the Pumas, Armadillos, Gray Foxes, Chingues (Patagonian Skunks) and Bats. Among the birds are the Rheas, Queltehues (Southern Lapwing), Flamingos, Bandurrias (Buff-Necked Ibis), Swans, "Patos Jergones" (Yellow-Billed Pintail) and occasionally small reptiles such as the Magellanic Lizard (Liolaemus Magellanicus). There is a network of trails of medium difficulty generally in very good conditions among which can be mentioned the Sendero Crater Morada del Diablo and the Sendero Etnocultural which leads to the Pali Aike Cave, an archaeological site discovered at the beginning of the 1930s and declared a Historic Monument in 1969. In this place were found vestiges of human occupation dating from approximately 8600 years ago. Other trekking circuits in Pali Aike are the Sendero Laguna Ana, of 900 mts., special place for Birdwatching of this part of Patagonia such as the the Flamingos and "Chorlitos" (Plovers) and some species of mammals and finally the Sendero Pozos del Diablo, of 2000 mts. Apart from the aforementioned Pali Aike Cave, another of the great attractions of the Park is the Caverna de Fell (Fell's Cave), discovered by the American archaeologist Junius Bird, where you can see cave paintings dating back to more than 11,000 years, in what was possibly the oldest human settlement of Patagonia and Tierra del Fuego. On the way to the Park, 124 km North of Punta Arenas, you can visit the today practically abandoned Estancia San Gregorio, the first sheep ranch founded in the Region of Magallanes, in 1876, until the 1950s San Gregorio lived years of great prosperity. Stranded on the beach, you can see the rusty remains of ancient ships, one of them is the steamboat "Amadeo", run aground in 1932, belonging to the once powerful Menendez-Behety Society, of great importance in the development of the Chilean- Argentinian Patagonia. A few meters away, is the tea Clipper "Ambassador", built in London and launched in 1869. Today reduced to a skeletal frame, this sailboat, along with its similar, the "Cutty Sark", exhibited as Museum in Greenwich, England, represent one of the last Clippers of the "Tea Race".